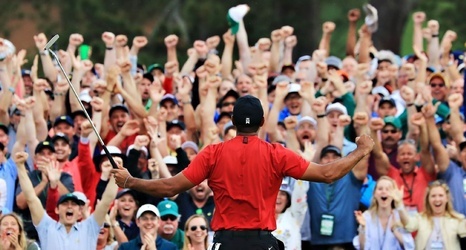 AUGUSTA, Ga. -- Past winners of the Masters gathered upstairs in the champions' locker room because they understood what they were watching, and knew they needed to do something special for Eldrick Tiger Woods. Bernhard Langer, Bubba Watson, Zach Johnson, Adam Scott -- they all realized they could not just close up their lockers, say their goodbyes, and jump into their luxury cars for a ride back to their privileged lives. Langer, 61, was the group elder, the leader of the band. The former winners showered after their rounds, shared a drink, and watched Woods play the 72nd hole on TV.